Trying to find your favorite songs online is not an easy task as they’re probably scattered all around the entire world wide web. However, now that technology has advanced till the point where web pages are no longer simply static pages that have text and pictures on them, more and more websites are popping up all over the web that will help make everyone’s online life a bit easier. SeeqPod is one such site that will definitely appeal to anyone who likes to listen to music. SeeqPod.com is a search engine which indexes every single music, music video and even podcast that are available to the general public on the world wide web. 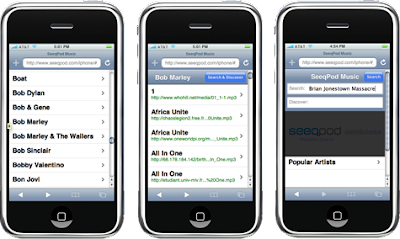 With the huge number of pages which the world wide web has, SeeqPod will almost always be able to find the song or music video which you are looking for. However, SeeqPod is not only a search engine for music, but also an online music player in your browser. Once you have found the song which you are look for, you can then add that to your playlist on the right of the screen and SeeqPod will automatically start playing the specified song. As you find even more songs that you like while listening to a certain track, that song can then be added to the playlist as well so that it will immediately play after the current track ends. This in built music player will definitely make it a lot easier for most people who just want to stream music to their computer there and then instead of going through all the trouble to download it and open it in a music player. Furthermore, SeeqPod still has a few other extra features that will make the site all the more interesting. First of which is the PodCrawler. Basically it shows what songs SeeqPod is currently indexing, the songs will slowly scroll by one by one, thus allowing you to click on any of them to listen to it immediately. This is a great way to discover new music as you usually won’t know what song you are about to listen to. Another useful feature is the “Discover” button, basically it acts as a suggestion button, showing you a list of other songs that SeeqPod has already indexed that are similar to the song that you are currently listening to. Thus you’ll be able to find new music that is similar to the songs which you already like, hence allowing you to “Discover” (as the name implies) more music that you will definitely enjoy. While there are indeed many other sites out there that will also allow you to listen to music, such as the popular Pandora, not all of them will allow you to search the entire world wide web for every single song out there. Hence, SeeqPod will definitely become a popular way for you to find and listen to music. Probably the best thing about SeeqPod is that you can use it on your iPhone too!